Last Friday I was priviledged to be present at Pete Shutler’s funeral. In case you hadn’t heard of him, he was quite a Dorset celebrity as the Accordionist from the band ‘The Yetties. If that still doesn’t ring any bells well he also plays the theme tune to The Archers on Radio four for the Sunday morning omnibus edition. As I grew up in Yetminster, Dorset, both The Yetties and the Archers were a significant element in my childhood. I was also a member of Yetmister’s Irish dancers. This was run by the very formidable Pam Common in the days long before Michael Flatley made the dance popular. She taught us all in the strictest style, similar to what you’d expect of a Ballet school. Pointed toes, arms either straight on either side of your body or very painfully, held up, shoulders to elbows straight with hands raised gently holding your partner’s. Saturday mornings in the Church Hall, every Saturday morning that is. My mother recalls being told by Mrs Common once that she ought to ‘consider her priorities’ when asking for me to be excused one Saturday for an Accordion exam. It was through the dancers that I met the Yetties, in particular Pete Shutler. 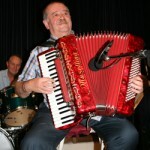 As the accordionist he would often play for us as we practiced and would even let me play along with him on those Saturdays or during the regular Ceilidhs held also in the church hall. Mrs Common’s husband Bob, was also a Yettie. He was the cider jug blowing percussionist. He left sometime during the seventies and was even our favourite school bus driver. Bob is a fun loving gentle man and it was delightful to see him on Friday, still jolly despite being widowed a few years ago. Despite arriving a good forty minutes before the service was due to start, I had missed all the seats in St Andrews church, and the church hall, which had been set up with speakers so that everyone who turned up could hear and be part of the service. I was extremely lucky to be able to park in the hall’s car park, especially as driving through the village, cars were parked along the road side from Stonyacres to Brister End. As Pete’s casket was carried through the church yard his ‘Willow’s Jig’ was played through the speakers. I was next to a father and his young daughter. She was wearing her heavy green wool and beautifully embroidered Yetminster Irish Dancers dress. ( Reminded me of my mother having to embroider my dress many years ago). They both new Pete far better than I and the young girl was very upset not to be seeing Pete anymore. She stood proudly for him as he passed, toes pointed and arms straight in true Pam Common fashion. She bowed as he entered the church, then burst into tears. I had always admired Pete’s accordion playing. I had been classically trained and although he tried on many occasion to help me loosen up, I did learn a couple of jigs and enjoyed playing along with this gentleman who was passionate about his music. The last time I saw Pete, and the Yetties was at the annual concert at Yetminster Fair. I had been re introduced to them by visiting the fair with my young sons. Their concert was full of great ‘sing a long’ favourites interspersed with some rather naughty jokes and rambling stories. They were the perfect choice for mine and Greg’s wedding blessing in 2007. They even managed to get me up and do a little bit of irish dancing! They stopped performing at the Fair a few years ago now and ‘retired’ as a performing group only very recently. We all sang ‘All things bright and beautiful’ accompanied by Sherborne Town Band and the birds on the church roof. An old friend of Pete’s shared his favourite Pete moments during his eulogy and Adrian Welsh played ‘Dark Island’. Bonny Sartin, fellow Yettie, sang beautifully ‘Life of a man’. I’ve shared the lyrics below as it really was perfect. Like the leaves we must wither and down we must fall. What was really special was that in the church, the hall and the church yard we all joined in with the chorus. ‘A man has his season, so why should we grieve’ is the phrase that sticks in my mind. After the prayers, ‘Tell out my soul’ and the commendation, Pete’s casket was carried out of the church with ‘Dorset is beautiful’ being played by The Yetties. If you’d like to hear it I found it on Youtube. I didn’t join the throngs who gathered afterwards at the Weavers Sports and Social club in Sherborne afterwards but I am certain that with such a gathering of folk singers and their fans it would have been a fitting celebration to a great man’s life. I certainly enjoyed your story of your relationship with this fine man. Dancing, painting, writing–how wonderful you have these gifts and share them.